Picking the best #2 in Hawks history was a little tougher than #1. A little, but not much. Current d-man Duncan Keith takes the prize over 50's goon Gus Mortson and edges out 70's d-man Bill White. Keith is now regarded as one of the top defensemen in the game today. He, along with linemate Brent Seabrook, form one of the most talented d-lines in the NHL. They were picked as a line for Team Canada for the Olympics this year, where Keith had 6 points in the tournament in route to winning the gold. I think its Duncan skating ability that separates him from the rest of the pack, the guy can realy fly. He also has steadily became an offensive threat from the blue line. His point totals have improved from 31, 32, 44, to 66 thus far this year. Keith was the Hawks second round pick in 2002 Draft. He was always a pretty prolific two-way defenseman in the amateur ranks, the knock on him was always his size. He was thought to be too small to be a successful defenseman in the big leagues. He proved the nay-sayers wrong, however, by bulking up to near 200 lbs. It has been a fun journey watching Keith mature as a player from his rookie season to today. He's a tremendous asset to team not just by being a superb shut down defenseman, but also contributing nicely with the power play as well. 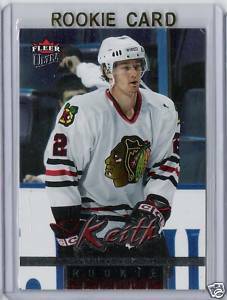 Earlier this year, the Hawks signed Keith to a 13 year contract extension, locking up #2 for the forseeable future. That signing, along with long term deals given to Jonathan Toews, Patrick Kane, and Marian Hossa, gives us long-suffering Hawks fans hope that a Stanley Cup may be in our future. oooh... beating out Bill White.. I thought I had predicted, but I was wrong. It was a close call, but perhaps a little favortism by me because I've actually seen DK play.